Just a little easel card...Magnolia of Course! This is a just quick post as I'm off to the dentist. Nothing bad, just fitting a couple of new crowns. I suffer with auto -immune disease and it plays havoc with my teeth. Hence more crowns than real ones and LOTS of root canals. This is Bohemian Peony Tilda from the BOHO collection. The papers are Pion and she is coloured with distress re-inkers. 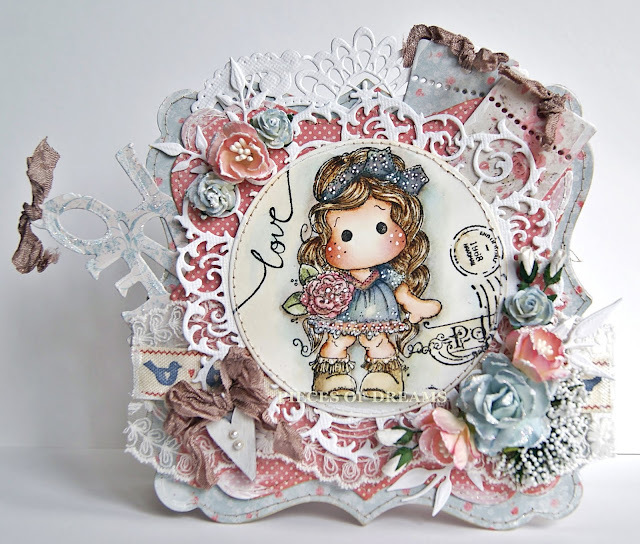 I used Marianne DIE LRO299, Go Kreate dies, Magnolia dies, a wooden painted heart, gesso, Glamour Dust, lace and flowers. 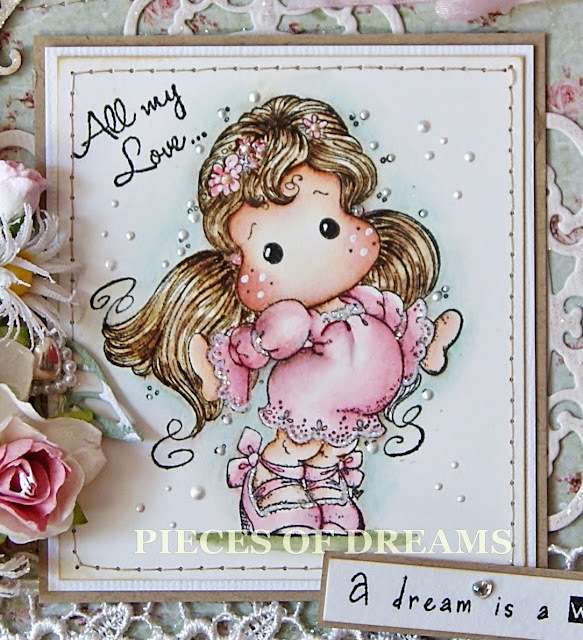 Most of the embellishments are available at Live and Love Crafts. 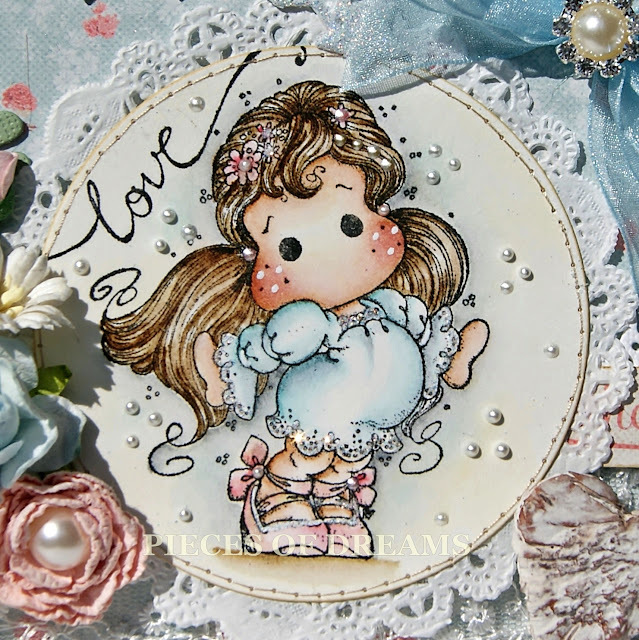 I added some distress ink to the border to match Tilda and a sentiment to the tag, which opens for a message. It's about time I posted another card here or I will be falling behind. This is my second one staring "Free Spirit Tilda", because I love her...I really do! I used some Bildmalana papers that were waiting patiently in the draw for over a year, just willing me to use them. It was their lucky day....I stitched and inked them. This is a square card. My Go Kreate dies stayed safely in their packets for a change, while I went retro. to the flowers as well. Does she look a bit Boho to you? She has Glamour Dust on her dress, some liquid pearls around her and she was painted with distress re-inkers. The sentiment just seemed to match. Enjoy your weekend, it's going to be lovely here in London and over the South East, so I will probably be found in the garden enjoying the last rays of summer. I am here with my "All About Magnolia" hat on today. Actually it's the only one I've got now as my Tildas Town one has been lost......have to get myself a new one. We are half way through our monthly challenge of ANYTHING BUT A CARD. Now I don't usually like this theme 'cos I really just love to make cards. But this time, I was looking at my Laura Ashley hearts that hang from my dressing table, and wham, I knew what I had to make! A little hanging Tilda heart, so here it is! I used a Marianne Creatables die LR0299. The paper is Pion and the rest has been cut with white Bazzill card. I cut the heart to open and attached a length of pearl string to hang it. The branch is a Joy Craft die. The gingham heart has a heart shaped clear gem and a rose and leaf. The flowers are from Wild Orchid Craft. They have gesso and Glamour Dust on them. I also added some Stickles to the card for a bit of sparkle. That's it really. 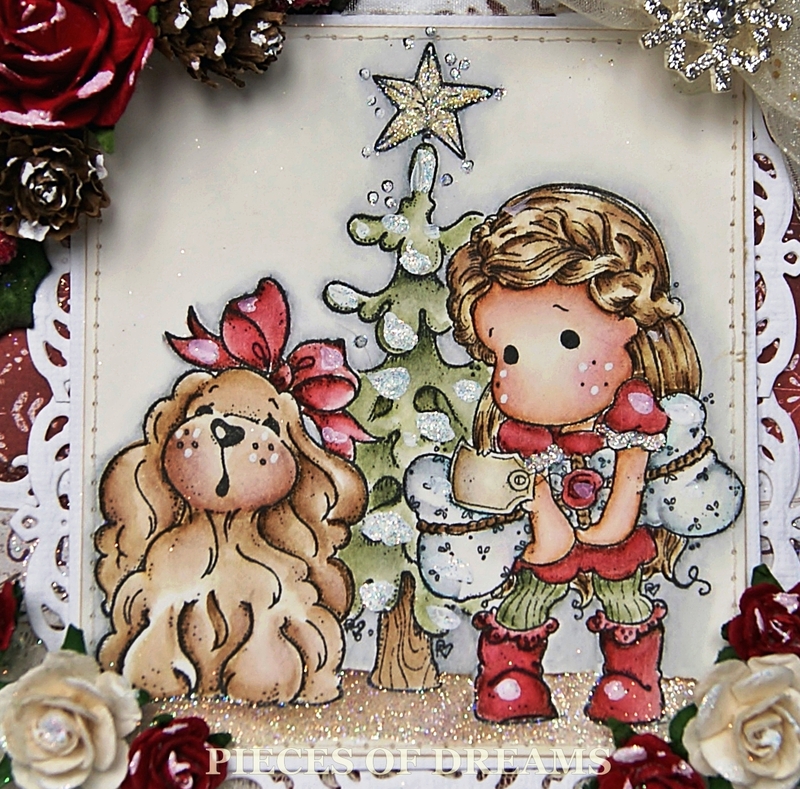 Tilda was stamped onto watercolour paper, painted with distress inks, cut out and inked round the exposed edges. I used Glue Gel to raise her above the card. I hope you will join in with us girls at All About Magnolia. As promised, here is my second Peace and Love Tilda. These pretty, vintage style papers are from Maja, Summer Crush. They are stitched and inked, and have the usual gesso. The Love die and Tag dies are Magnolia. 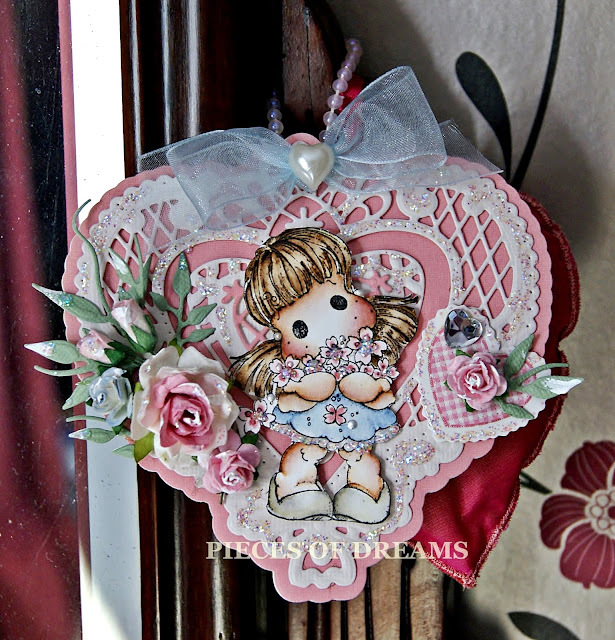 The fancy oval around Tilda, the heart above her and the Branches are from Joy Craft. I added some luscious lace, a piece of linen ribbon, some distressed seam binding and a painted wooden heart. The flowers have gesso and sparkle added. This is "Bohemian Peony Tilda", painted with distress re-inkers onto Langton paper. She has been stitched, and I've added white pen and Glamour Dust. Close up of the Doo Hickey and the flowers. I hope you like the card. 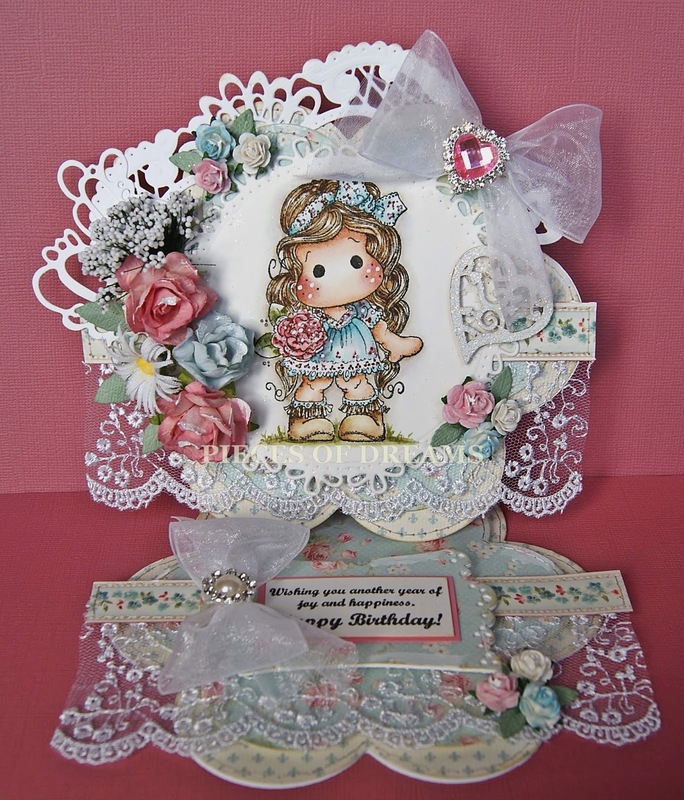 It was so much fun to make and that is what card making is all about isn't it? It brings out the inner child and calms our minds for a little while or in my case a longer while. I love the sanctuary that is my craft room. 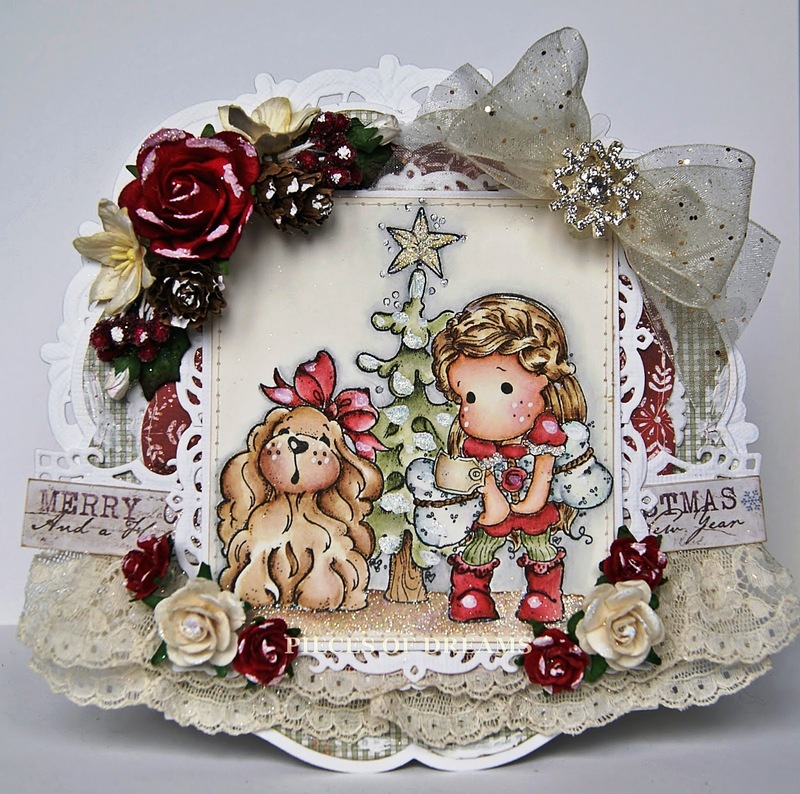 I have a couple of Christmas cards to add over the weekend, until then, have a lovely day. I made this weeks ago, while experimenting with masking, and used three stamps together. It was painted with distress re-inkers, an 00 brush and Langton Hot Press paper. There is also gesso and copious amounts of Glamour Dust. Go Kreate dies to shape the card. 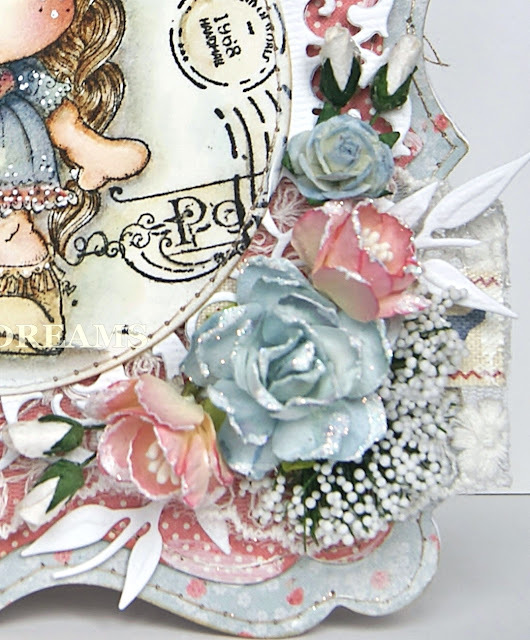 An old but pretty Marianne die adds interest to the back and a Spellbinders die makes a frame for the image.The papers are stitched, and have a little gesso on the edges. 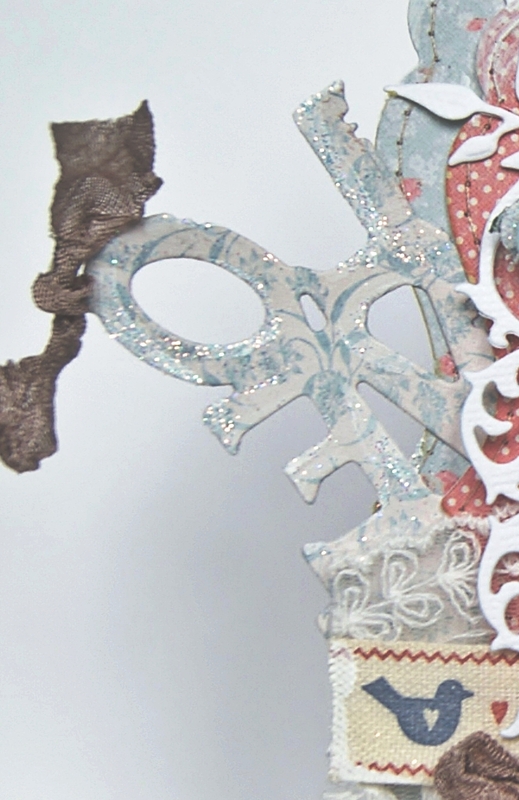 I then gathered some ivory lace and added a Maja border. The flowers have tiny Pinecones and berries with gesso and Glamour Dust and I've added a pretty diamanté Snowflake to an organza bow. 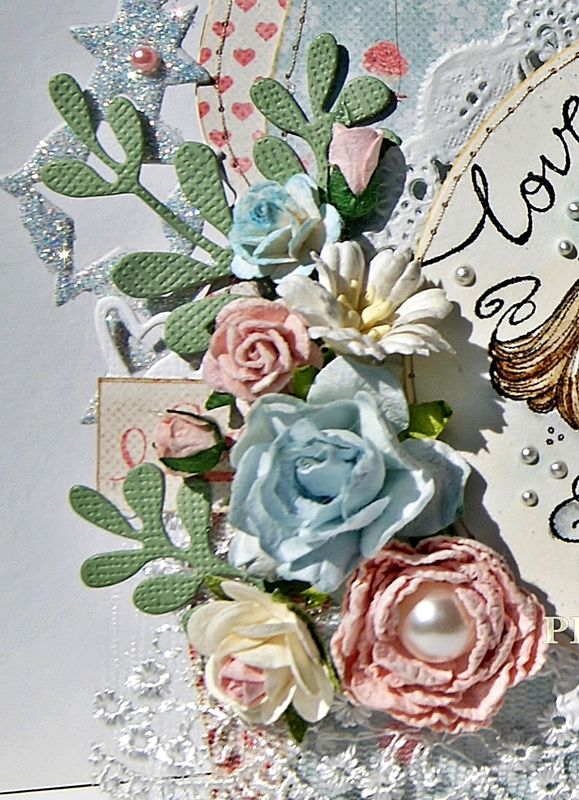 Most of these embellishments can be found at Live and Love Crafts. I really love making Christmas cards and would like nothing more than make them all year if I could. Well, I have been home from holiday for a week now and as soon as the mountain of laundry was washed, ironed and stored away, I spent a little time in my craft room. Sir Stampalot sent me the some new Magnolia stamps so I had fun making some "Hippy" cards. The new "Boho" collection is perfect for painting in distress colours. It gives them a real vintage feel. As you probably know, I am part of the long running "Tildas' Town Challenge" design team. Unfortunately this challenge is closing as the store owner is no longer going to sell Magnolia stamps. So sad. So, I would like to say a BIG thank you to Pam and all my talented teamies....I will miss you....and I am sure to bump into you all in Blog Land as we continue our journey. 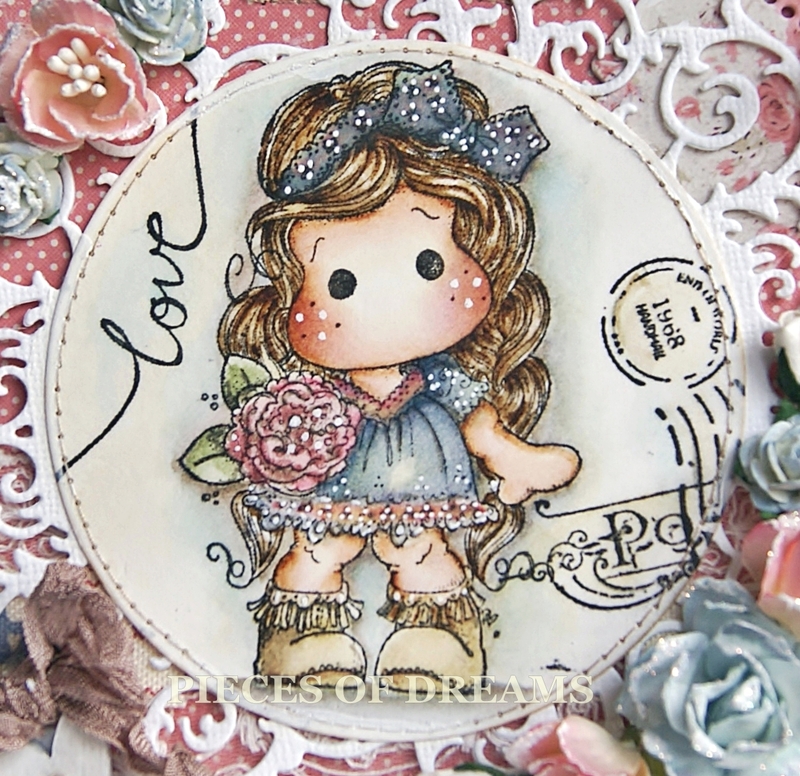 This is FREE SPIRIT TILDA, coloured using distress re-inkers, a 00 brush and Langton watercolour card. 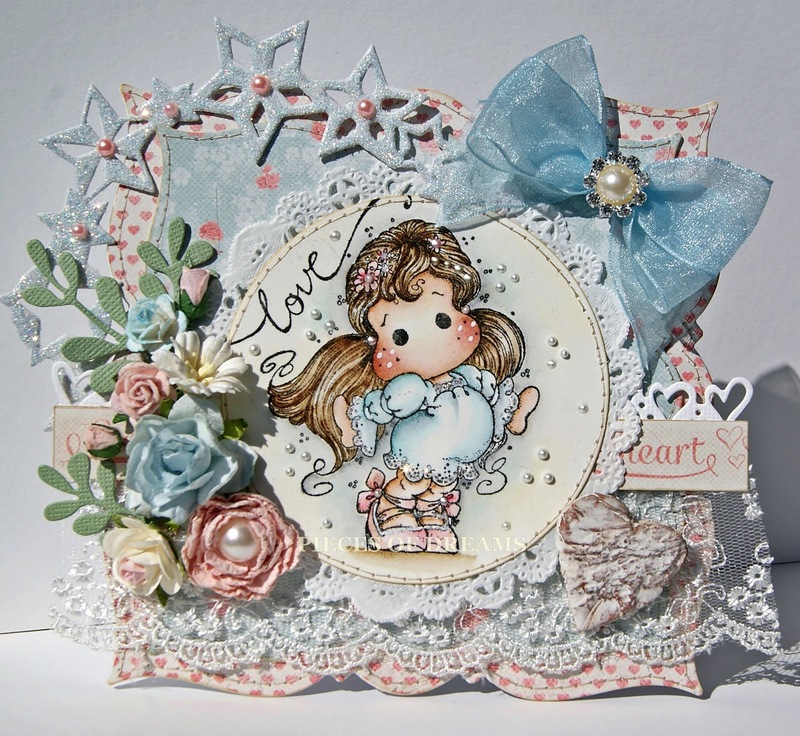 The card shape was cut with GoKreate dies and the paper is SUMMER CRUSH by MAJA. I have inked and stitched all the edges with a deeper thread than usual and I quite like the contrast. The star crescent die is new from JOYCRAFTS. 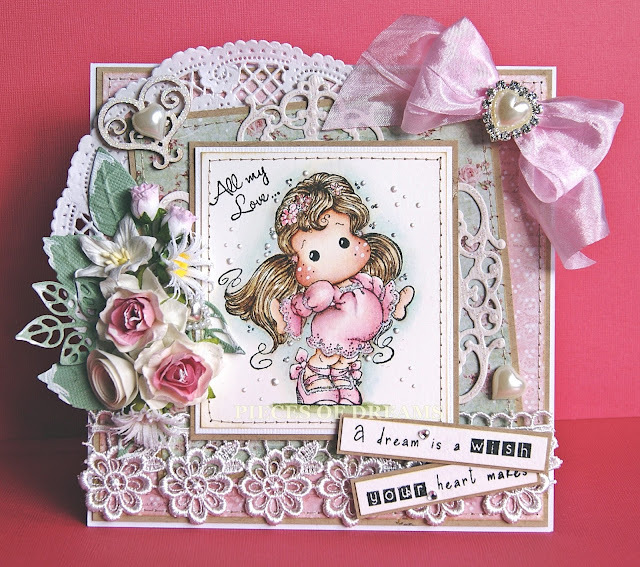 I cut it in card and paper, gluing and doubling for strength, then adding a good sprinkle of Glamour Dust and pink pearls. The border was cut with the "Tilda's Lace" Doo Hickey die and two more Doo Hickey dies made the leaves for the flowers. I used some Liquid Pearls and Glamour Dust on Tilda and around the image, before sewing it to a paper doily. There is a nip in the air this morning and I am watching the children going off to school with their parents, all wrapped up in their coats. I do hope we haven't yet said goodbye to summer. I will be back in the week with a second "Boho" card.